Retained surgical items place patients at risk of a wide range of complications, including infection, internal bleeding, and permanent disability related to the removal of infected tissues or organs. When this happens, the patient is entitled to compensation in a malpractice case. Retained surgical items are any foreign materials that are inadvertently left inside a patient after a surgical procedure. 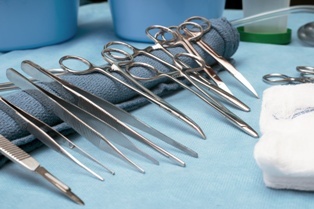 Sponges account for about 70 percent of the retained surgical objects left inside patients. Since they are typically small in size and hard to see when they have been used to soak up blood, it is easy for the operating team to overlook a sponge if the surgery involves complications or hectic operating conditions. Many hospitals are starting to use sponges with barcode or radio frequency tracking technology, but this type of error still occurs thousands of times per year. Since these symptoms can indicate a wide range of medical conditions, many people do not make the connection between their discomfort and a retained surgical item. They may believe they have simply caught the flu or that recovery from their surgery is a little more complicated than they expected. Imaging tests such as ultrasound, mammography, magnetic resonance imaging, and fluorodeoxyglucose positron emission tomography are the most common way to diagnose a retained surgical item. Sometimes, tests for another unrelated reason reveals the item still inside the patient. Patients who have experienced a retained surgical item have a solid malpractice case. The legal doctrine that applies to retained sponges or tools is known as res ipsa loquitur. This is a Latin term that means "the thing speaks for itself." Since surgical items should not be left inside a patient, the foreign object is proof in itself that malpractice has occurred. Calling a lawyer immediately is the best way to protect your right to malpractice compensation for retained surgical items. Hospitals are well-represented and eager to minimize their financial loss from this type of claim. Without someone who can advocate for your needs, you risk a settlement that is much too low to properly compensate you for the effects of the surgical team's negligence. The dedicated Inland Empire Law Group's attorneys have helped residents of Rancho Cucamonga, San Bernardino, Victorville, Fontana, and the surrounding areas receive the medical malpractice compensation they deserve. Call (888) 694-3529 to schedule a free, no-obligation consultation.